Peep-lo. I remember hearing it while walking along the beach of Pine and Curry Island Scientific and Natural Area (SNA) on Lake of the Woods, near the Canadian border. A diminutive shorebird was running from me and alerting its mate. Peep-lo. 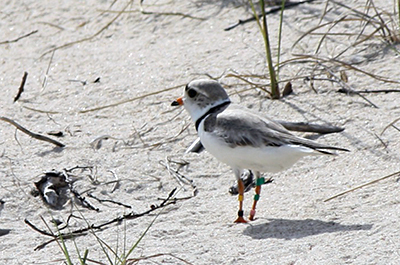 At a mere six inches tall, sand-colored with a black eyebrow and necklace, the Piping Plover can be hard to see against a sandy background (the one with the leg bands in the adjacent photo was banded on the coast in of Mississippi in 2010). I searched and finally found a nest close to where one had been found in previous seasons. In 2013, this was the only pair of plovers to nest on Pine and Curry Island. Piping Plovers are small shorebirds that use open sandy beaches and alkali flats for feeding and nesting. Because these beaches are also favored by people, Plover populations have declined from habitat loss and disturbance. In 1985, Piping Plovers were federally listed under the Endangered Species Act across their range, including the Northern Great Plains, the Great Lakes and the Atlantic coast from North Carolina into Canada. They are also listed as endangered under Minnesota endangered species law. The Nongame Wildlife Program has monitored Piping Plovers on Pine and Curry Island since 1982. Each year we look for plover nests and put a wire mesh cage around them to protect eggs from predators. These little birds are pretty accepting of the cage and walk through the mesh openings to return to the nest almost immediately. We also mark off the area as a wildlife sanctuary to limit disturbance by people. A few weeks later we re-visit the nest to see if any plovers have hatched. 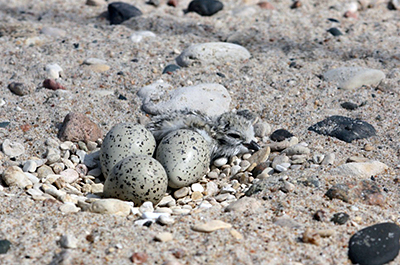 The plover nest is called a scrape. The male scrapes aside sand to form a depression; the female sits in the depression and decides whether the location is suitable. Once she is satisfied, they line the nest with small pebbles or pieces of shell (I have seen males throwing shells into the scrape before the female gets out!). Four tan eggs with black speckles are laid. These eggs blend in to the surrounding (such as those shown in the adjacent photo along with a newly hatched chick). She incubates the eggs for 25 to 28 days until they hatch. Piping Plover chicks are precocial meaning they are relatively mature and mobile when they hatch. The chicks look a bit like cotton balls with legs, and in my humble opinion, are one of the cutest baby birds out there. Parents brood the little ones to protect them from heat, cold or predators as long as they fit under the adults. If predators (like us humans) get too close, an adult will feign a broken wing to try to lure the predator away. Twenty years ago, Minnesota had four breeding locations with Piping Plovers. Today the only place they are still found is Pine and Curry Island. These birds need sandy open beaches for nesting — and not just any beach. They want pebbles to help their eggs blend in and areas high enough above the shoreline so high water and waves do not flood the nest. They also require a relatively wide, undisturbed beach so that it is more challenging for predators to find the eggs. Pine and Curry Island was purchased and designated as a Scientific and Natural Area to protect Piping Plovers and state threatened Common Terns. Plovers historically nested on other beaches on Lake of the Woods, but with high water levels, many beaches around the lake have been lost or are now too narrow for plovers to nest. Lake levels have affected Pine and Curry Island as well. Over the years, numbers of nesting plovers on the natural area have declined as portions of the island have washed away. Over 1.5 miles of this 4 mile long island have disappeared since the late 1980s. High water levels, storm events, and possibly a change to how the Rainy River flows into Lake of the Woods are contributing factors. We have a bit of a conundrum too: there is more vegetation on the island than there was historically, which is not favorable for these birds, but the vegetation helps stabilize the island. I did not find any plover nests when I returned to Pine and Curry Island in 2014. This was not the first year without nests. Also, in mid-summer, the island suffered major rain events that resulted in "breakthroughs" where water washed over the island. These kinds of events likely occurred historically. Beaches and sand islands are constantly changing. Sand, whether in large lakes, rivers, or the ocean, moves with wind and wave action. Structures such as jetties and groins can affect sand movement and alter how beaches form and reform. Additionally, there is some evidence that the amount of sand reaching Lake of the Woods has decreased. Many factors are contributing to the loss of the island, and there is no silver bullet to fix it. Hardening the shore with rock rip- rap is often used by lakeshore owners to stop erosion, but this will not work for plovers. They need access to the part of the shoreline that gets wet with waves for foraging on the variety of insects they find there. Pine and Curry Island is still the best remaining habitat for these birds in Minnesota and luckily it is both protected and open for the public as an SNA. Sandy dunes habitat is rare for Minnesota and provides a great opportunity to learn about beach-going wildlife. In addition to plovers and terns, in the spring a variety of shorebirds like Marbled Godwit, Ruddy Turnstone, and Dunlin have been seen. The rare Hairy-necked Tiger Beetle, a species that favors sandy locales has been found here. Finally, a variety of plants adapted to sandy habitats are found here and in few other locations across the state. Pine and Curry Island Scientific and Natural Area is a neat place, and I enjoy visiting it every year as we try to find nesting Piping Plovers and help them continue to survive in Minnesota. The Scientific and Natural Areas Program is fortunate to have dedicated and talented friends who are passionate about the preservation and stewardship of natural areas. One such group that may come to mind, after some reflection, is artists. When you think about it, there is an abundance of artistic work inspired by nature and natural areas. Locally we have a number talented folks who work in a collaboration called Project Art for Nature. This group has chosen sites in Minnesota and Wisconsin that inspire them and from this inspiration create art. These pieces are shown periodically in exhibitions in the area. What sets this group apart is that up to 20% of all sales of their work sold at these shows are donated to organizations working to protect natural areas. We at the Scientific and Natural Areas Program are grateful for the donations that we receive from Project Art for Nature, and sincerely thank the artists for their talent, generosity and dedication in preserving these special places. 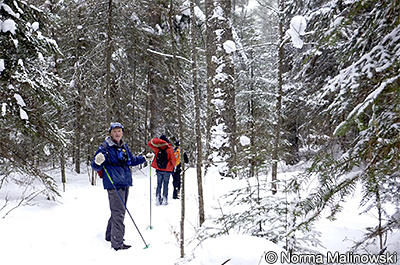 Winter is a perfect time to get out and experience an SNA in a whole new way. Whether you are enjoying exploring by snowshoe or warming up next to a brush pile you helped stack, we're sure you'll have a great time. So layer up and get on out there! A full list of winter events is available on the SNA Events Calendar. How can a bird uncover a road built in 1857? While working on the development of an Adaptive Management Plan for Lost Valley Prairie Scientific and Natural Area (SNA), I came across an article titled "Birds of the Lost Valley Prairie Natural Area" by William Longley. In his article, Longley mentions an old township road, flanked by cottonwood trees and possibly part of a military road built in the 1850's. The township road and the cottonwood trees he refers to were easy to see earlier this year following the first phase of a project to remove invasive species such as common buckthorn and tartarian honeysuckle on the SNA (see adjacent photo). In 1850, the United States Congress passed an act to establish military roads across the Minnesota territory to provide protection and support for settlers arriving on the frontier (Singley, 1967). A road from the Mississippi to St. Louis Rivers was considered the most important to development of the territory. The Point Douglas - St. Louis River military road was the first to be constructed and was over 200 miles long. It began at the junction of the St. Croix and Mississippi Rivers and headed north to the St. Louis River, near Superior, Wisconsin. Intrigued that a military road may have passed through Lost Valley Prairie SNA, site steward Jim Smetana researched further to determine whether or not the 'old' township road and the military were one and the same. He received guidance from the Borchert Map Library at the University of Minnesota and the Washington County Surveyor's office to locate historical maps and survey records. 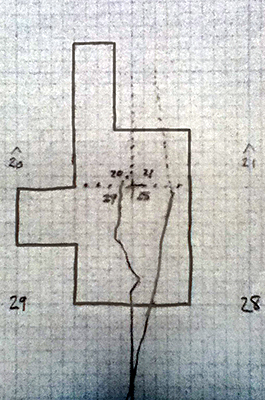 Jim then used these maps to create his own map illustrating where the military and township roads ran through the property (his resulting map is shown here, displaying the location of the military road on the right and township road on the left). The military road was built in 1857. It entered the SNA from the southeast and ran northerly through the SNA for 3/4 mile. Today, part of the former road is a crop field in the process of being restored to prairie. This summer and fall seed was collected on-site by SNA volunteers and field staff to begin the restoration. The township road was built in 1887. It followed a line west of the military road, and was, until late this fall, still easily recognized by the two rows of large cottonwood trees marching through parts of the SNA. The cottonwoods marking the road edges grew up after it was abandoned as a township road, and were not planted along the road while it was in use. The cottonwoods were just recently removed, to create a larger habitat for grassland bird species such as the Henslow's sparrow. In the end, the birds helped us learn the history of this site, and we in turn do our part to help them to continue to thrive here. And as Jim Smetana notes, it's "a lot of fun to say a territorial [military] road crossed through this Scientific and Natural Area; a piece of history." Birds of the Lost Valley Prairie Natural Area, William H. Longley 1990. Singley, Grover. "Retracing the Military Road from Point Douglas to Superior". Minnesota Historical Society. 1 Apr. 2014. Web. 30 Apr. 2014. Visiting Itasca Wilderness Sanctuary SNA approximately twice per month from August through November, site steward Janet Rith-Najarian has been steadily recording biodiversity data. 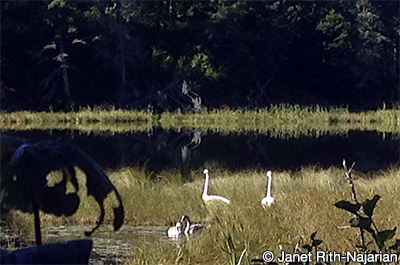 She is adding these observations (such as the trumpeter swans shown in the adjacent photo) to the iNaturalist website. Anyone interested can participate and Janet encourages her fellow site stewards to try it out for their site. Check out her project for the Itasca Wilderness Sanctuary on iNaturalist to see what she has reported so far. When possible SNA staff try to make an initial visit with new site stewards to walk the site and discuss management. New site steward Keith Myrom had the opportunity to do just that on November 2 with SNA Prairie Specialist Brad Bolduan at Rock Ridge Prairie SNA. Duties can vary greatly from site to site on SNAs. An example of a unique duty can be found at Moose Mountain SNA, where deer hunting is allowed, but only on specific dates in the fall for archery and firearms. In this season site stewards Lynn and Andy Wiemann are an immense help in placing and replacing hunting signs at the parking lot so visitors are aware of this specific information. Thanks for all the work you do for SNAs, stewards! 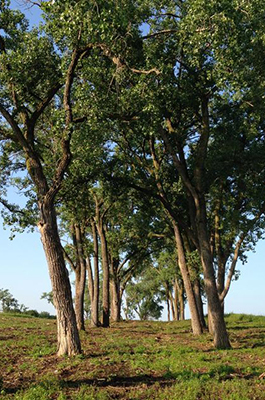 Nature Notes is the Minnesota Scientific and Natural Areas quarterly e-newsletter. It seeks to increase interest, understanding and support of natural areas while promoting involvement in the protection of these special places. Contact us at sna.dnr@state.mn.us. Find more online: volunteering | calendar of events | e-news archive | Facebook.